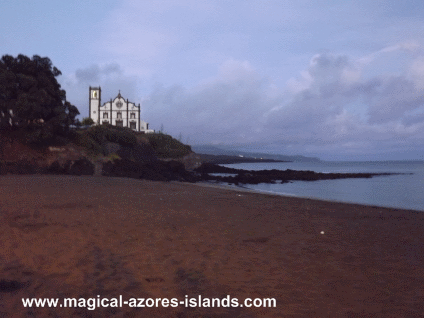 For all of the times I have visited Sao Miguel Azores Beaches, it never occurred to me that most of them I don't know by name! I usually say something like: "let's go to the beach near Ribeira Quente"; Or "why don't we go to that secluded little beach in Caloura?". I finally realized my gap in knowledge when I decided to write this page. 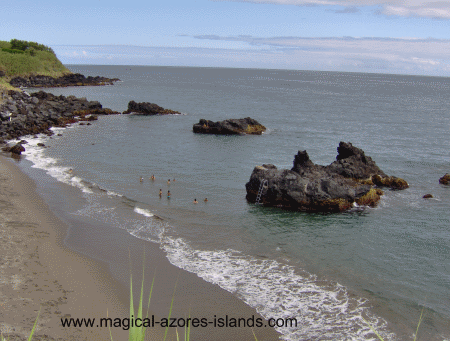 When I started doing research for the names of these Azores beaches I realized why I never refer to them by name. Most of the maps do not list their names and for a long time most of the beaches did not have signs. Thankfully one of my eight maps of Sao Miguel Azores actually has some of their names. So in most cases I can give you their proper names, along with a short description, location and a picture. Just East of Vila Franca one will find the beach called Praia da Vinha da Areia. My sister stayed at the pink hotel in the background for her honeymoon some years ago (I don't want to date her by saying when exactly!). 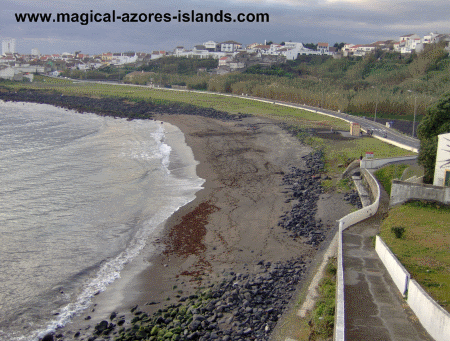 On most maps this beach will be close to the town of Ribeira Cha on the south side of the island. It is a long and sandy beach. Sorry no official name for this one! It's that beach in Mosteiros. Possibly called Praia de Mosteiros, but I wouldn't bet on it. 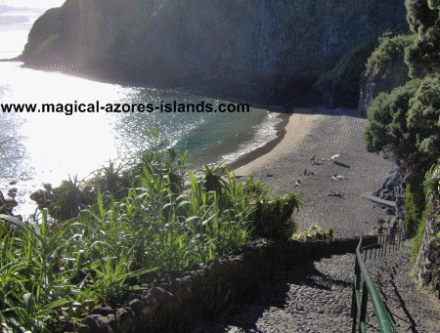 It is a little beach in the village of Mosteiros located on the west side of the island. The view is quite nice and it is quite rocky in places. I would not recommend surfing here as there are a lot of rocks right where you would surf. 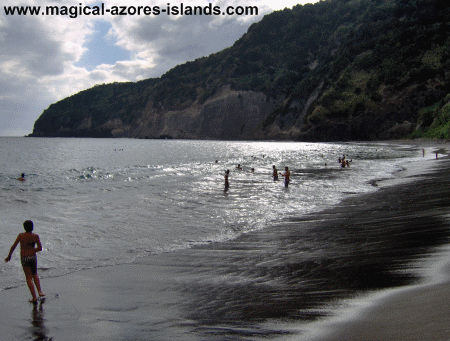 Santa Barbara beach is on the north coast of Sao Miguel. 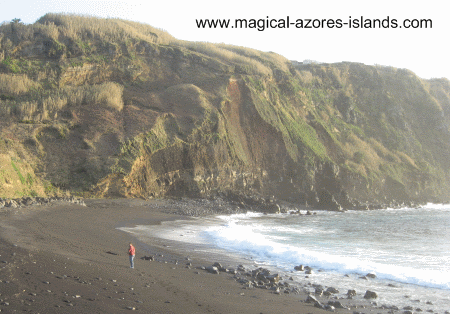 This is one of the longest sandy Azores beaches and it is very popular with surfers. There were several surfers out at the beach on the December day when I took this picture. As nice as this beach is, it's tough to find. Most maps don't show it. It is just outside of Ribeira Grande near Ribeira Seca. This beach is located at Porto Formosa on the North side of the island. It's very sandy and set in an attractive location. The only downside is parking. The hot summer day when I took this picture I couldn't get a parking spot! 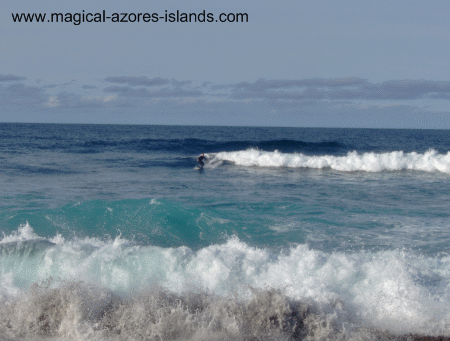 Amora beach is located between Ponta Garca and Ribeira Quente. 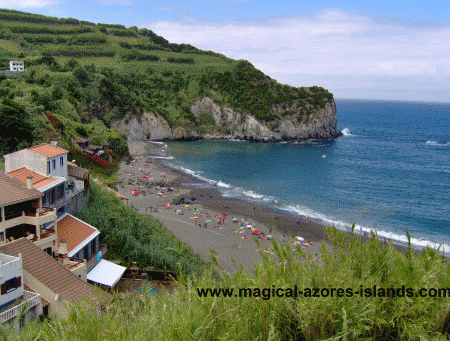 It is only accessible while on a hike from Ponta Garca to Ribeira Quente or vice versa. I didn't know what the name of the beach at Ribeira Quente until a visitor to the site sent me a note. 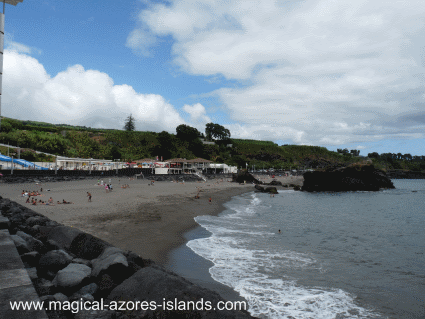 He said: "The beach at Ribeira Quente is called Praia do Fogo ("Fire Beach") due to some hot springs below the surface of the water at low tide"
The beach is located right in town and that it is a long and quite sandy beach. I have gone swimming there on more than one occasion. You can find Ribeira Quente on the south side of Sao Miguel, not too far from Furnas. 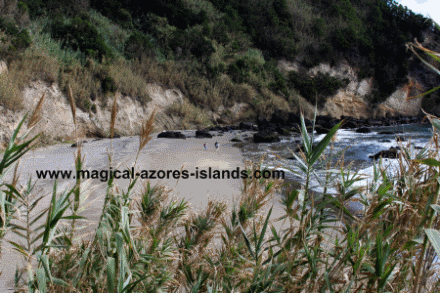 If you are in Lagoa during the summer, you will find that this little beach is quite popular with the locals. Lagoa is on the south side of the island and is on all maps of the island. There's still a few I left out, including a little one in Povacao, among others. 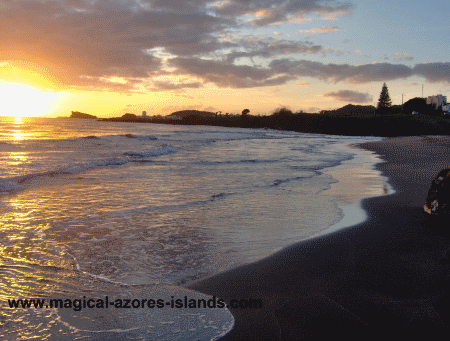 I hope you enjoyed seeing the pictures of these Azores beaches. I recommend visiting any one of them on a vacation when the weather is warmer in June to September. 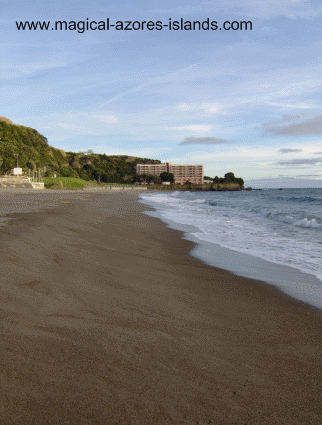 Thanks to Mike O'Doherty, from Lübeck Germany for providing a few names of beaches.